It’s been well over a decade since the Point Reyes Farmstead Cheese Company released California’s first classic-style blue cheese, its amazing Original Blue. I was thrilled to try the company’s new Bay Blue Cheese at the Good Food Awards in San Francisco in January. Now it’s going to be tough to choose between the two blues! (I haven’t had the chance to try them side by side.) 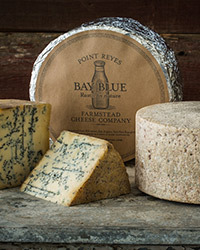 The new Bay Blue, made exclusively with milk from Point Reyes’s herd, of course (that’s where the “farmstead” comes in), is dense and creamy with a wide, deep flavor and a savory, balanced tang. It’s delicious on its own, in salads, on burgers, or paired with honey, fresh and dried fruits, and nuts.